Experienced modelers go to great pains to tie down their servo and throttle leads, and some find unplugging a Castle controller from the receiver disrupts all their work. 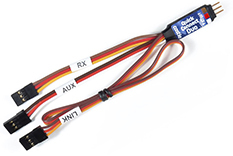 Many have asked for something like a Y connector that gives an open lead for easy Castle linking, but a traditional Y harness doesn't work when the other branch of the Y is connected to a receiver, the signal line must be disconnected from the receiver. 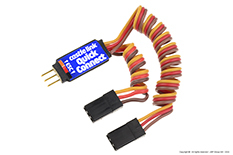 Castle Quick Connect and Quick Connect Duo do just that. They detect the presence of a Castle Link adapter on the free lead and switch the controller's signal line from the receiver to the Castle Link. Easy as that. Follow the applicable Connection Diagram (found on the inside of the package or the link below) when connecting the Quick Connect or Quick Connect Duo. Don't forget to use the included piece of heat shrink tube to secure the ESC lead to the Quick Connect.